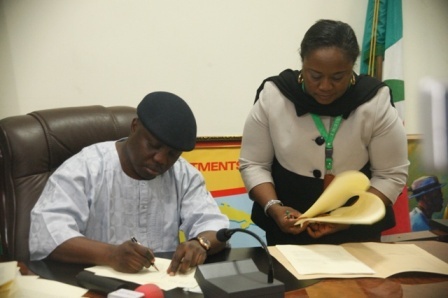 Delta state governor Dr. Emmanuel Uduaghan has signed the 2012 appropriation bill of 437 billion naira into law and promised to pay special and prompt attention to the Transport, Education and power sectors. Recall that the governor had in December last year presented a budget proposal of N383,390,132,338: 100.00 to the state House of Assembly, The budget was made up of N169.82 billion for recurrent expenditure and N213.57 billion for capital expenditure. But the new face of the budget, tagged “Budget of Sustainable Development”, had showed an aggregate increase of over N54 billion from the earlier proposed sum of over N383 and a total of over N75 billion increase when compared to the 2011 approved estimate of N361.90 billion. While signing the budget into law at the Exco chambers, Government House, Asaba, Governor Uduaghan explained that the transport sector would enjoy prompt attention as his administration has already taken delivery of over 200 buses to cushion the effect of fuel subsidy removal by the Federal government. His words “We are paying special attention to the transport sector because we are providing palliatives to reduce the hardship the removal of fuel subsidy would cause the people”. He also noted that the energy sector would also enjoy special funding so that there would be uninterrupted supply of electricity and reduction on the use of generator, explaining that the state government would soon take delivery of 300 transformers and install them to increase electricity supply. “We are expecting about 300 transformers and we hope to use them to boost electricity supply. Once this is done, people will reduce the use of generators and consequently fuel”. He assured Deltans that his administration would do better this year through accelerated infrastructural development and called on Deltans to support his administration and provide useful and constructive criticism rather than destructive and injurious ones. “My administration welcomes constructive criticism and not destructive ones. We need constructive criticism from the opposition and all other camps but not the criticisms that will distraction us and lead to the distraction of the state. We are focused and need positive advice”. Governor Uduaghan who commended the state House of Assembly for promptly passing the appropriation bill which he described as a record in the history of the state, promised to work harmoniously with the House to enable it make laws that would improve the living standard of the people. Earlier, during the presentation of the bill to the governor, the Speaker of Delta state House of Assembly, Engr. Victor Ochie said the House decided to make a difference in passing the bill in a record time. The Speaker promised to continue to keep to the trend in the passage of future bills but could not explain the reason behind the increment in the proposed budget. Uduaghan, had while presenting the 2012 budget to the state House of assembly late last year, explained that the budget was predicated on result-oriented strategies, adding that “Government is moving away from the usual budget practices of mere allocation of figures to a practical, structured, and robust approach that can sustain development. This Budget, therefore, is crafted to address the problems that have confronted us over the years”, he had said.